Part six of Sports Enthusiasts’ 2015 College Football Preview will look at Conference USA’s West division as well as predicting the champion of the C-USA Championship Game. Below is the schedule for the 2015 College Football Preview. Below is an in-depth look at each team in the Conference USA West Division. 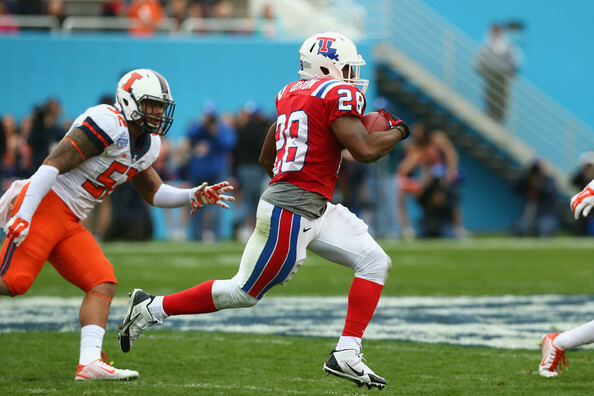 Louisiana Tech nearly won the 2014 C-USA Championship Game, but came up short against Marshall in 26-23 loss. 2014 was also the second year of Skip Holtz’s tenure and he led them to their first bowl game since 2011, beating Illinois 35-18. The third year under Holtz will have seven starters back on offense, but one of them will not be at quarterback due to Cody Sokol graduating after a 3,436 passing yard season with 30 touchdowns and 13 interceptions. Replacing Sokol is the inconsistent Jeff Driskel from Florida. When Driskel is good, he can play at the top level, but that is the wildcard to do that over the course of a season. He will have Kenneth Dixon to hand the ball off to. All Dixon has done in his first three years is rush for 3,410 yards and become the school’s all-time leading rusher. He ran for 1,299 yards and 22 touchdowns in 2014. The top three receivers also return for La Tech including Trent Taylor, who caught 64 passes for 834 yards and 9 touchdowns. If Driskel can be consistent (and healthy), the offense should do well once again in 2015. On defense, six starters return including three apiece on the line and in the secondary. The line’s top playmaker will be Vernon Butler at tackle after he made 1st Team C-USA in 2014 with 56 tackles, 1 sack, and 12.5 tackles for loss. The linebacker unit sees all three starters depart, but the replacements are all seniors. The secondary is also senior laden, but the star is junior free safety Xavier Woods. Woods was 1st Team C-USA after making 71 tackles, 1 sack, 2.5 tackles for loss, 7 pass breakups, and 6 interceptions in 2014. The defense should be good in the 2015 again. La Tech opens with a home game against FCS Southern before a road trip to open conference play against Western Kentucky and then another road trip to Kansas State. Their non-conference schedule wraps up with a home game against Louisiana-Lafayette (Oct. 3) and a road game at Mississippi State (Oct. 17). In addition to WKU out of the East, they also get a tough game against Middle Tennessee (home) and a winnable game at home versus Florida International. Their toughest West opponents (Rice and UTEP) are both on the road, but Louisiana Tech is in a good spot to make it to a second straight C-USA Championship Game. UTEP improved drastically in 2014 on both offense and defense, which culminated with a bowl game berth (New Mexico Bowl), but lost 21-6 to Utah State. Year three for Sean Kugler is expected to provide even more. Six starters return on the offensive side led by running back Aaron Jones. Jones ran for 1,321 yards and 11 touchdowns to lead the team and he will shoulder the load early on in the season with a new quarterback set to take over. Mack Leftwich and Garrett Simpson are expected to battle it out for the starting QB spot, but they will surely top last year’s production of 1,858 yards, 12 touchdowns, and 6 interceptions by Jameill Showers. The top receiver is gone (27 catches for 579 yards and 2 touchdowns), but his production can easily be replaced with better quarterback play. The offensive line returns four starters so there should be plenty of time for the new QB to gel with the offense. The defensive side of the ball returns five starters including three on the defensive line. The line will need to get after the opposing quarterbacks. In 2014, UTEP allowed 177 yards rushing per game and recorded 26 sacks. At linebacker, Alvin Jones returns to lead the group. He recorded 55 tackles, 1.5 sacks, 7.5 tackles for loss, and an interception. Arkansas graduate transfer Kelvin Fisher will also be in the mix to start at one of the linebacker spots. The secondary returns Devin Cockrell as the lone starter from a unit that allowed 191 yards passing per game and 51.7% completions. The defense is likely to take a step back in 2015, but it may not be a big step back. UTEP opens with three straight road games in 2015 against Arkansas, Texas Tech, and New Mexico State. They finish their non-conference slate with a home game against FCS Incarnate Word. In Conference USA play, they have winnable games from the East Division against Florida International (road), Florida Atlantic (home), and Old Dominion (road). They also get both Rice and Louisiana Tech at home, which makes them a threat to finish in the top spot as well. UTEP should be in a bowl game once more in 2015. Rice has been to three straight bowl games between 2012 and 2014. In 2013, the Owls won the C-USA Championship Game by defeating Marshall 41-24. 2015 is a chance to reach the title game again and a fourth straight bowl game. The offense has six starters returning including quarterback Driphus Jackson and running back Jowan Davis. Jackson threw for 2,842 yards with 24 touchdowns and 8 interceptions while also rushing for 401 yards and 1 touchdown as the third leading rusher. Davis ran for 956 yards and 6 touchdowns while the second leading rusher, Darik Dillard, ran for 652 yards and 11 touchdowns. Dillard also returns this season to give Rice a 1-2 punch in the running game. The top two receivers are gone, but the third, fourth, and fifth leading receivers return. In addition, only two starters return on the offensive line. Rice may have some early season struggles, but should be able to reach their 28.8 points and 399 yards per game they recorded last year. Rice’s defense has been hit hard by losses with only three starters returning. Linebacker Alex Lyons was the top tackler in 2014 with 71 tackles, 3 sacks, and 2 tackles for loss. The next five leading tacklers depart while Nick Elder was the seventh leading tackler at 40 stops, but did not start any games and is expected to take over one of the remaining linebacker spots. The defensive line and secondary also return one starter. After giving up 28.5 points and 386 yards per game in 2014, this unit will take a step back with the lack of experience. Rice opens their season against FCS Wagner at home before three straight road trips against Texas, North Texas, and Baylor. They also face Army at home on October 24. From the East Division, Rice will face Western Kentucky (home), Florida Atlantic (road), and Charlotte (home), which should provide a winning record against those teams. They also face Louisiana Tech at home and a road trip to UTEP. With their schedule, Rice should be making a fourth straight bowl appearance. North Texas made a bowl game in 2013 after a nine year absence. They won that bowl game against UNLV, but fell to 4-8 in 2014 with only nine returning starters. Dan McCarney is entering his fifth year and hoping to return to a bowl game in 2015. The offense returns six starters beginning with quarterback Andrew McNulty. McNulty started the final six games and finished the season with 1,295 yards, 6 touchdowns, and 7 interceptions. Antoine Jimmerson and Jeffrey Wilson also return at running back to provide some help to McNulty. McNulty will also have Carlos Harris back to throw to after he caught 70 passes for 863 yards and 3 touchdowns. The offensive line returns only one starter, which may hurt some of the numbers early in the season. North Texas put up 27.2 points and 326 yards per game in 2014 and this year should produce similar or better numbers. The defense also returns six starters, but none of the top three tacklers return. The defensive line has three starters back, which easily makes this the strongest unit on defense. They gave up an average of 162 yards rushing per game and should be able to produce that kind of performance again. Linebacker has two starters returning, but lost their top guy in Derek Akunne. The secondary has only Kenny Buyers returning, but he should be able to lockdown one of the corner spots. After surrendering 29.8 points per game in 2014, the defense should be able to match that again in 2015. North Texas does not play opening week and will face SMU on the road in their first game on September 12. They then face Rice at home before back-to-back road games at Iowa and Southern Miss. They also face Portland State (home) and Tennessee (road) as part of their non-conference schedule. Out of the East Division, NT will face the top trio of Western Kentucky (home), Marshall (road), and Middle Tennessee (road), which puts an upper limit on their finishing position in the West. North Texas will probably need an upset or two to reach a bowl game. It is hard to believe how fast Southern Miss fell in College Football after 2011. In 2011, Southern Miss went 12-2 with an upset victory over Houston in the C-USA Championship Game, but fell to 0-12 in 2012. They went 1-11 in 2013 and 3-9 in 2014. 2015 will be the third year in charge for Todd Monken. Monken will have plenty to work with on offense, as ten starters return from 2014 and some nice talent has transferred in. Nick Mullens threw for 2,470 yards with 12 touchdowns and 9 interceptions last year, but may be challenged by former TCU player Tyler Matthews. Ito Smith was the top running back in 2014 with 536 yards and 2 touchdowns, but it could be Michigan transfer Justice Hayes who ends up as the number one running back. The top two receivers, Michael Thomas and Casey Martin, both return as does the entire offensive line. Southern Miss put up 17.1 points per game and 316 yards in 2013, 19 points per game and 365 yards per game in 2014, and will certainly obliterate those numbers this year. The defense under Monken has struggled, but perhaps that is because there was not much in the cupboard. In 2013, eight starters returned and gave up an average of 41.9 points and 436 yards per game. 2014 was a a bit better as six starters returned and gave up 35.4 points and 451 yards per game. There will be five starters back in 2015. Michael Smith will be anchoring the defensive line at tackle, but perhaps the biggest addition is at defensive end with former Auburn player Ricky Parks. The linebacking unit has two starters back while only one returns in the secondary. Picasso Nelson is the returning starter in the secondary after starting 10 games as a freshman and recording 36 tackles, 7 pass breakups, and 2 interceptions. The defense will continue to make small steps forward in 2015. Southern Miss will open the season with home games against Mississippi State and FCS Austin Peay before back-to-back road trips against Texas State and Nebraska. The fifth game against North Texas at home on October 3 could determine which team finishes fourth. From the East Division, Southern Miss draws Marshall (road), Charlotte (road), and Old Dominion (home) while having to face UTEP at home and Louisiana Tech on the road. Southern Miss could be pushing for bowl eligibility with an upset or two in C-USA play. Texas-San Antonio is a relative new program entering their fifth season of play in 2015. Larry Coker has been in charge since the start and has led them from the FCS to C-USA. In 2013, UTSA went 7-5 in their first season of C-USA competition before falling off in 2014 with a 4-8 record. 2015 may not be any better. Coker has only two returning starters on offense, but that may not be a bad thing. In 2014, UTSA had ten starters returning, but only put up 17.1 points and 298 yards of offense per game! 2015 will see Michigan graduate transfer Russell Bellomy vying for the starting quarterback spot. Jarveon Williams is likely to assume the running back spot after running for 325 yards and 3 touchdowns as the second leading rusher last year. The offensive line returns only one starter while the top receiver returning from 2014 is tight end David Morgan. Despite the dearth of experience, it is hard to imagine UTSA doing much worse of offense than they did in 2014. The defense has only four returning starters from a unit that was respectable in 2014. The defense gave up 25.9 points and 370 yards per game with ten returning starters last year. Middle linebacker Drew Douglas is the top returning tackler after recording 71 stops, 1 sack, and 6 tackles for loss. The defensive line has zero returning starters while the secondary has the other two starters returning in Bennett Okotcha and Mauricio Sanchez. The defense has been consistent under Coker, but with the lack of experience, there is a strong possibility of a step back. UTSA has a brutal non-conference schedule with games against Arizona (road), Kansas State (home), Oklahoma State (road), and Colorado State (home) in their first four weeks. In conference, UTSA draws Old Dominion (home), Charlotte (road), and Middle Tennessee (home) from the East Division. It will be a long season for UTSA if both sides of the ball struggle. It is a rebuilding year for UTSA in 2015. The Conference USA West Division is a three horse race with one team slightly better than the competition. Louisiana Tech looks like the best team in the division, but the duo of UTEP and Rice could win the division as well and it would not be a surprise. North Texas and Southern Miss will be battling it out under those three and will both need at least one or two upsets to get back to a bowl game. UTSA is in rebuilding mode with only six starters returning. Below is the predicted order of finish. The previous part of the 2015 College Football Preview looked at the C-USA East Division and predicted Western Kentucky to win the division. That will set up a C-USA Championship Game between Western Kentucky and Louisiana Tech. In that game, Western Kentucky is predicted to defeat Louisiana Tech for the Conference USA Championship. The next part of the 2015 College Football Preview will look at the American Athletic Conference’s East Division. That can be found on Tuesday, July 21 here at Sports Enthusiasts.